As an Extension Agent I receive numerous calls each year regarding insect problems. Homeowners and professionals alike would agree that pest problems could be among the most challenging aspects of gardening in Florida. There are millions of insect species in our world and more than 100,000 different species active in the United States. However, less than 1% of these actually feed on plants in a harmful way. There are many more beneficial insect species than harmful ones. Several of these “good bugs” in fact feed on the “bad bugs”, and keep them in check naturally. In our efforts to suppress pests in our yards we need to do more to protect these beneficial insects. If you have a set schedule of spraying pesticides it could be wasteful and the worst thing we can do to upset the natural balance. Many pesticides do not discriminate but kill beneficials as well as pests. If a pest problem is suspected Integrated Pest Management (IPM) should be used. The first step in IPM is to correctly identify your pest. After, you have identified the problem you can take the proper measures to suppress it without harming any beneficial insect populations. Beneficial insects fall into two categories – Predators and Parasites. Predators consume the entire host, killing it. Parasites can feed on the host, or lay eggs that produce larvae that feed on the host pest. Besides controlling pests, beneficial insects also perform other functions valuable to man. These include: pollination of crops; manufacture of medicines and pharmaceuticals, production of silk and textiles; honey and wax; and breaking down organic matter. Assassin Bugs: Assassin bugs are generally black or brown, but many are brightly colored, and 1/2 to 1 inch in length. The head is elongate with a short, curved beak. 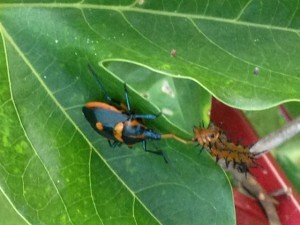 Nymphs are just as effective in controlling pests as adults. They will inflict a painful bite if handled. An example of an assassin bug is the wheel bug. Lacewings: They are green or brown, and about 3/4 inch in length. The wings are transparent with many veins. The adults may be predaceous or feed on pollen. Lacewing larvae are elongate and have large sickle-shaped mandibles. They are commonly called aphid lions and feed on aphids, other small insects and eggs. Lady Beetles: Lady beetles are among the best-known and most beneficial insects. 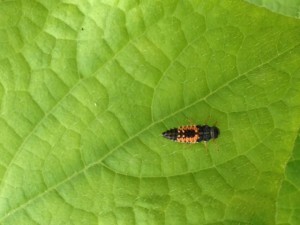 Both the adults and larvae of lady beetles consume aphids, immature scale insects, mealybugs, mites and other soft-bodied insect pests as well as insect eggs. Adult lady beetles are oval shaped and most are orange or reddish with black markings. Most lady beetles are about 1/4 inch long. Many lady beetle larvae are elongate, somewhat flattened and covered with small spines. They are usually dark or black with bright colored spots or bands. Studies have found that 200-500 aphids are consumed during the larval stage. Parasitic Wasps: These wasps are very small, most less than 1/8 inch long and usually not noticed. Some wasp larvae feed and pupate inside the host and the emerging wasp leaves a small circular hole in the body of the host as evidence of parasitism. Many harmful insects such as aphids, whiteflies, scales, leaf miners and caterpillars can be parasitized. Other parasite larvae live on the outside of its host where they construct numerous small, white cocoons attaching to the body of the host. Earwigs: Many earwigs are predaceous upon lawn insect pests such as chinch bugs, small mole crickets and sod webworms. This is a large species up to 1 inch long with mandible-like pincers in the abdomen. In laboratory observations they consume up to 50 chinch bugs a day. Predatory Stink Bugs: The most familiar stinkbugs to gardeners are those that are crop destroying. However some stinkbugs are beneficial. Spines projecting from their thoraxes can identify these, whereas plant feeders have round shoulders. The predaceous forms also have short, stout beaks while plant-feeding forms have long, thin mouthparts. 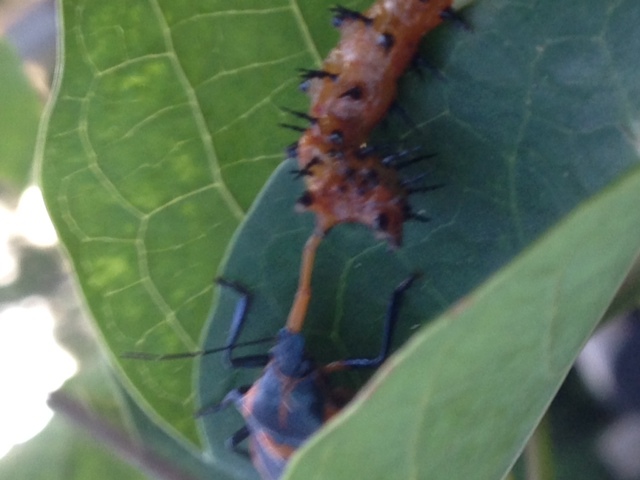 The predators feed on many insects, especially caterpillars. If you would like to learn more about beneficial insects or other topics related to horticulture and Extension come visit our Extension Spring Open House. The Open House will be held at our office (615 Paul Russell Road) May 9 from 9am until 1pm. Admission is free! We will have educational booths representing a wide variety of topic such as: wildlife, invasive plants, sustainability, and much more. Our Master Gardeners will be having a plant sale and we will be hosting tours of our grounds and state of the art sustainability systems. Call (850) 606-5202 for more information.